DS4 Drum shield 5 section drum shield, drum screens or drum shields Items included in your purchase. 5 panels Full 1/4" x 24 x 60 Crystal clear acrylic 12 Bright Chrome Hinges or Living Hinge which easily attach and hold panels tightly. Total Height;5 ft. With easy assembly instructions. Welcome to our drum shields & custom Acrylic drum shield and drum screen panels, for Drum sets, Drum kits and drum n bass. We take great pride in these drum shield enclosures and the quality of their construction. With 15 years of custom fabrication in the plastics industry behind us, we can construct any possible enclosure for your drum sets, drum kits, drum and bass, or any type of sound or noise that you need to control. I bout this for my church and i was very happy with it, I love the price quality and how fast it was shipped best product ever will definitely buy again from you. Pennzoni shipped the drum shield quickly. 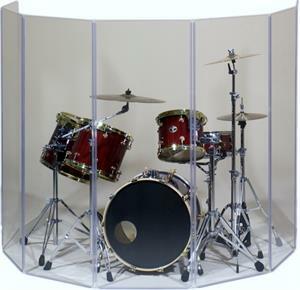 The drum shield was purchased as a secondary shield for the youth band room of a church. The sanctuary of the church has a brand name shield that performs the same as this shield provided by Pennzoni. Once set up in a church setting, the drum shield has significantly reduced the direct and overbearing sound waves away from the audience and other stage performers. The audience can now experience the stage presence of vocalists and other musicians without the spikes of hard cymbal crashes or piercing high hat and snare strikes. I am a hard player, so the vocalists used to have a hard time hearing themselves in the monitors. With the drum shield, they don't feel the need to cover an ear to strain to hear the complete audio mix and I can play with less restraint. The drum shield reflects the sounds backward and seems to blend the drums with the overhead PA Speakers and monitors, rather than a direct blast of sound. One thing I should have done was purchase the 6-panel shield with the deflectors, since there is still some room for sound deflection improvement. I am considering pairing the shield with (5) 2' x 2' sound-dampening studio foam blocks, to increase dirty noise absorption from the bass and toms. Otherwise, a great investment that I would certainly purchase for myself or recommend to a friend.